A key to success for any business is getting your customers what they want, when they want it. This means your fulfillment process is crucial. But as your company grows, you may find that shipping solutions that don’t talk to your ERP system are grinding your fulfillment process to a halt as employees manually copy information from one system to the other. Wouldn’t it be great if you could speed up your fulfillment process and improve accuracy? Now that we’ve seen the shipping integration in action, let’s look at how the fictional company aACME Education Solutions uses it in their day-to-day operations. aACME customer Southglen High School places an order for 30 French textbooks, 3 of the corresponding teacher’s manuals, and 30 workbooks. As soon as the order is opened, aACE automatically generates a shipment with the tracking status Ready to Pick. The shipment is immediately passed to the aACE Pick app. On the warehouse floor, aACME employee Ned Walker logs into the Pick app via a shared iPad. 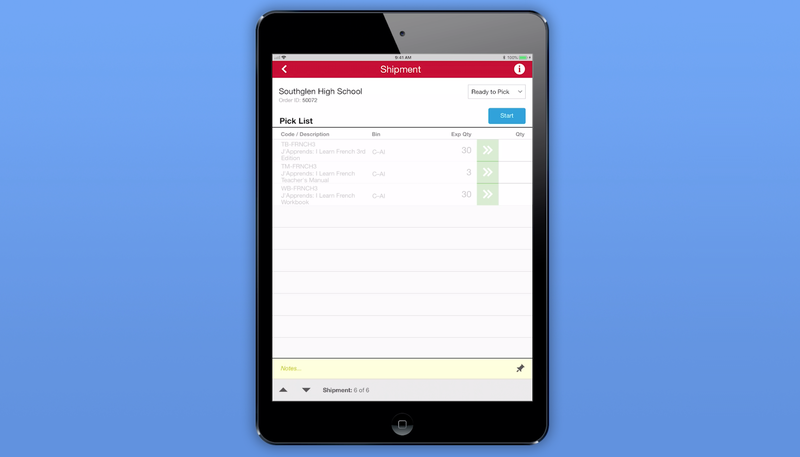 He chooses the Southglen High School shipment from a list of shipments that are ready to pick. In the shipment’s detail view, he sees each line item in the shipment, the bin where each line item is located, and the expected quantity of each item that he needs to pick. When Ned taps the Start button, the Pick app updates the shipment record’s tracking status to In Progress. When Ned finishes picking the required textbooks, he enters the quantities of each item into the Pick app. When he’s finished with the shipment, he taps the Done button and the app updates the shipment’s tracking status to Ready to Transmit. From there, aACE automatically transmits the shipment to ReadyCloud. Over in aACME’s Shipping Department, employee Kristie Hernandez packages the shipment. She then logs into ReadyCloud’s ReadyShipper terminal and schedules the packages for delivery. The shipment information is automatically pulled back into aACE, where the record is updated with cost and tracking information and the shipment’s tracking status is changed to Shipped. An invoice for the shipment is automatically generated — and all of this happens without Kristie ever needing to log into aACE. Another source of frustration for companies like aACME is entering and reconciling courier bills. The aACE+ ReadyCloud integration makes this a snap. Drew Sanderson works in aACME’s Accounts Payable Department. Rather than manually entering the courier bill at the end of each month, Drew can see all of the shipments he hasn’t yet purchased at a glance with aACE’s Build Courier Invoice feature. With one click, Drew can organize each shipment, its costs, and its tracking information for easy line-by-line comparison with the courier’s statement. What if the cost of a shipment on the courier’s bill doesn’t match the cost in aACE? For example, what if an address turned out to be residential instead of commercial? If Drew finds a discrepancy, he can easily adjust it in the purchase. That change automatically updates the shipment record, which in turn updates the order so the costs stay correct. To keep shipping costs in check, his aACE solution is configured to automatically send notifications to an oversight group if the difference between the courier’s bill and the shipment cost in aACE exceeds a certain value or percentage. For a company like aACME with hundreds of shipments per day, this automation saves hours of labor and keeps the fulfillment process running smoothly. To learn more about this feature or find out what else aACE can do for your business, contact us today.